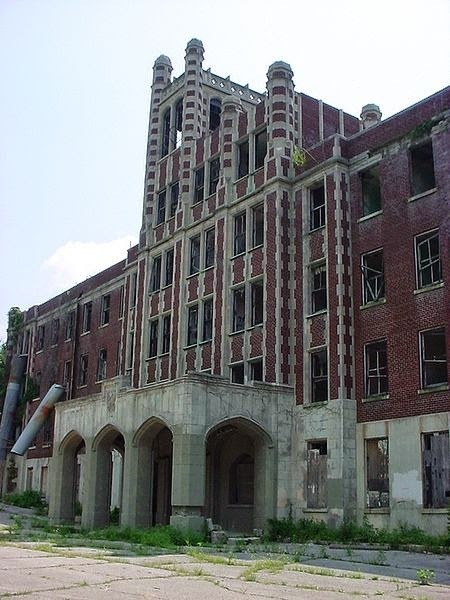 The Waverly Hills Sanatorium is a hospital located in southwestern Louisville/Jefferson County, Kentucky. It was built in 1910 when the county had an outbreak of tuberculosis. It closed in 1962 when TB was no more a common disease and the place ceased to be important any more. It was subsequently featured in many reality-based ghost hunting shows, including the famous “Ghost Hunters” (one of my personal favourites) and it is now known as probably the most haunted place in United States. According to Wikipedia, “the worst time for deaths was at the end of the 2nd World War when troops were returning from overseas with very advanced tuberculosis cases. Some independent researchers suggest that since 162 people died at Waverly Hills in 1945, the highest total number of deaths possible over 50 years was approximately 8,212”. Today, visitors told of slamming doors, lights in the windows, apparitions, sounds of footsteps as well as a old wheelchair that seems to move about on its own. It is classified as a Period 4 (Year 1924 – 1944) structure as the first original wooden building in 1910 was eventually replaced with the current concrete structure in 1926. SW sector (6-2): This area is the patients’ room. The Flying Stars combination here is known for spirit activities. In an old feng shui text, it was mentioned “When the Qian and Kun trigrams come together, the gods and ghosts too will gather”. The number 6 is Qian trigram while 2 is the Kun trigram. The Sitting Star 6 has a bigger influence here but since it is distance timely, it is too weak to bring any positive effect on the patients here. 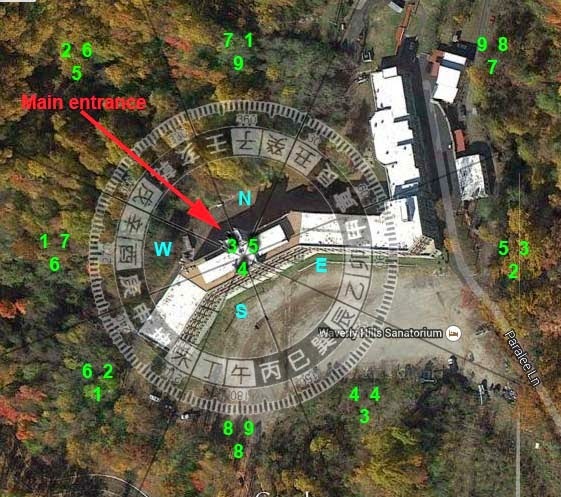 NW sector (2-6): This is where the main entrance is located and the combination here is also the 2-6 combination known for spirit activities. The Facing Star here is 6 and as mentioned, it has little positive effects due to its distance timeliness. East sector (5-3): The Sitting Star 5 is timely while the 3 is a fading energy. Due to the Wood (represented by 3) clashing the Earth energy represented by 5, the effects are inauspicious. 3 represents wind while 5 represents diseases, so together, in the old text, it is mentioned the area will be plagued by an airborne epidemic. Hysteria can also be brought about by the energy. Externally, there is nothing much except thick forest areas that surround the entire compound, which acted as a means to contain the TB outbreak.